The NBA Draft is supposed to be one of the marquee night in the NBA. 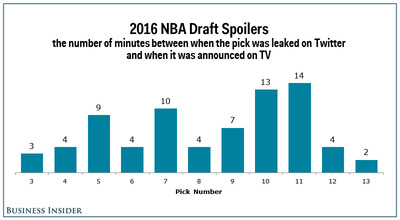 Unfortunately, thanks to NBA insiders and the NBA’s own eyebrow-raising rules, the NBA Draft has also become absolutely unwatchable. The biggest issue with the NBA Draft is that every pick is known several minutes before the pick is announced on television. It is like watching something on a severe tape-delay in the world of instantaneous social media. During the first round of this year’s draft, each of the first 13 picks was announced on Twitter at least two minutes prior to Adam Silver making the announcement at the podium. In one case, the insiders announced the pick on Twitter 14 minutes before Adam Silver. Here is how much earlier picks 3-13 were leaked on Twitter (we left out pick Nos. 1 and 2 since those were known prior to the draft). The situation is almost comical at times as the pick is leaked on social media, everybody knows who is going to be taken, and the ESPN announcers still have to pretend like they don’t know. This leads to situations where it appears that the pick has been whispered in the ear of the announcer and he tries to act like he is just guessing on who will be selected. This happened several times, including at pick No. 10. The pick, Thon Maker to the Milwaukee Bucks, was leaked on the internet 13 minutes prior to the official announcement. It was a bit of a surprise since questions had been raised just prior to the draft about Maker’s age and reports said his stock was tumbling all the way to the second round for many teams. But listen to ESPN’s Jay Bilas (far right) at the 0:20 mark below, just before the pick was announced. Is Bilas just guessing or has he been told like the rest of us watching at home? It is worth noting that he can be seen looking at his phone just as the camera comes back to the table. Players wearing the wrong caps. The spoilers are not the only problem with the NBA Draft. There is also the bizarre rule that says teams can’t make trades official during the draft which leads to this awful charade where players either have to pretend they got drafted by a team they will never play for or everybody is just left in limbo not knowing who really drafted a player. The NBA Draft is going to be one of the biggest nights in the lives of these kids. It is also a huge night for fans as the fortunes of their favourite teams can change with a single pick. For good or bad, the image of these players on stage will last forever for both fans and the players and the NBA has made them almost entirely meaningless in many cases. Here is Marquese Chriss after being drafted by the Sacramento Kings. Everybody knows that Chriss has been traded. ESPN has announced the trade and even Chriss had been told ahead of time by his agent. And yet here he is, on stage being photographed in a Kings hat and in front of Kings logos, a team he will probably never play for. Then he steps off stage to do an interview, still wearing a Kings cap even though it is the Phoenix Suns who actually made the pick and it is their fans who want to get to know their new player. In other cases, teams drafted players under the cloud of speculation that the player would be traded later in a deal that has not been finalised. The entire point of the NBA Draft is to know which teams drafted which players and to actually see the kids walk on stage and put on that team’s cap. The NBA’s no-trade rule ruins both of those. The problem is there is no easy solution to the spoilers. The NFL Draft used to have this problem when cameras would show a prospect sitting in the green room while a certain team was on the clock. The prospect would be talking on the phone with a gigantic smile on his face and everybody in the world knew the team was drafting that player. The NFL fixed this by simply not showing these players on television. So it is on the fans to just avoid social media if they don’t want spoilers. But that’s not fair to the fans when so much of sports these days is fans interacting or consuming analysis through social media. Unlike the spoilers, there is a simple solution to the players-in-wrong-caps fiasco. Just allow the trades to be official as they happen. Yes, the NBA has rules about the salary cap that make trades a bit more complicated. But the teams know the rules and it wouldn’t be that hard to have somebody at the NBA crunch the numbers quickly and OK the deal. The NBA can also easily add a rule that says no first-round draft pick can be traded until after his rookie season. This would increase the drama of the NBA Draft as trades would have to happen before a player is picked and more trades would go down. We also would know exactly who that player is going to play for once that pick is announced. Problem solved. Until then there is little reason to watch the NBA Draft unless you really have nothing else to do.